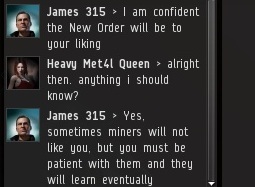 I received a convo request from Heavy Met4l Queen yesterday. For those who have been following this blog for awhile, HMQ is a miner who scarcely needs an introduction. Was HMQ on the Red Pen list? Well, let's see. She first entered the public eye by becoming the leader of a resistance movement against the New Order, attempting to mobilize the miners into a full-scale rebellion. The movement, complete with its own anti-New Order propaganda posters, also focused on creating a mass petition to have CCP add an anti-bumping clause to the EULA. Yes, the Red Pen was probably appropriate. 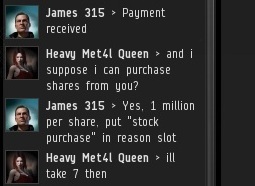 Without warning, HMQ deposited the 30 million isk necessary to be absolved of her crimes and join the New Order family. She then became the proud owner of seven freshly-minted shares in the New Order. HMQ's decision to switch sides closed the book on a long-running adversarial relationship between herself and the future of highsec. I've always been of the opinion that our Final Victory is inevitable. 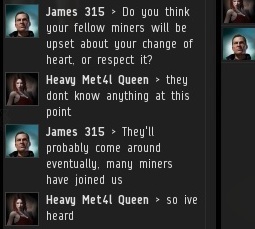 Our mission is not to destroy the miners of highsec, but to liberate them from their greatest enemies: themselves. In time, every one of our enemies--no matter how implacable--will eventually join us and experience the bliss of the New Order. Some rebellious miners may disapprove, but they should see it as an opportunity. If HMQ can join the New Order, anyone can. Though HMQ's decision came out of the blue, it shouldn't come as too great a shock. Most miners, when they read the Code carefully, find themselves in agreement with much of our cause. And our Agents, with their professionalism and impressive skills, are the greatest ambassadors for the New Order that anyone can imagine. If you're a miner who still opposes us, take note. The paradise of a New Order-dominated highsec is only a matter of time! Don't waste your time fighting it. 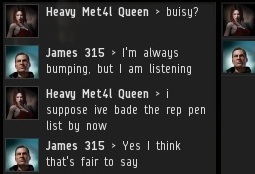 I remember when I met Heavy Met4l Queen for the first time when the Order went to annex Elonaya. Contrasting my first impression of her to now, I'm very impressed with her acceptance of the Code. Heavy Met4l Queen, welcome to the New Order family; I look forward to seeing you at stockholder votes and in the belts! My hearty congratulations to HM Queen! This is truly an achievement for the New Order! This is a happy day for the New Order!! Welcome HMQ!! This is a glorious event! I am now going to celebrate this occurence by sleeping in my bed. Welcome to our wonderful family, HMQ! My name is Orions Lord I was a miner. And henceforth October 25th shall be known among bumpers as Orion's day, a New Order-wide festivity in honor of Orions Lord, who declared he was a miner on this very date.